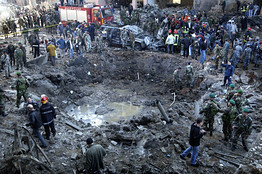 Rescue workers and soldiers stand around a massive crater after a bomb attack on former Prime Minister Rafik Hariri in Beirut, Lebanon, Feb. 14, 2005. There is no hope for Lebanon unless the U.N. and the West will enforce the tribunal's findings on the Hariri assassination. In the coming weeks, the United Nations will indict the killers of Lebanese Prime Minister Rafik Hariri in its first-ever tribunal to try terrorists. As the international prosecutors of the Security Council's Special Tribunal for Lebanon prepare to make their case on the February 2005 assassination, in which Hezbollah features prominently, the "Party of God" and its backers in Tehran and Damascus are once again taking off their gloves. Iranian President Mahmoud Ahmadinejad recently visited Lebanon to show support for Hezbollah, indicating that Iran, and not only its minions, would act in the event of an adverse ruling. In June, Hezbollah leader Hassan Nasrallah as well as Iran and Syria threatened the Lebanese government and Prime Minister Saad Hariri—son of the slain head of state—with dire consequences if they support indictments of the organization. Hezbollah threatened to stoke civil unrest and break up the government, which could spark another war with Israel and destabilize the entire region. In the past five years, Hezbollah has shown that it usually makes good on its threats. Between July and December of 2005, a range of anti-Hezbollah lawmakers and journalists died or suffered grievous injuries in attacks across Lebanon, and bombings hit several anti-Syrian neighborhoods in Beirut. In the first six months of 2006, Nasrallah claimed he was negotiating with Lebanon's leaders to surrender his weapons, only to trigger a devastating war with Israel. After the war, Hezbollah unleashed more violence at home, killing Lebanese legislators, including the Sunni Walid Eido, the Christian Antoine Ghanem and Minister of Industry Pierre Gemayel, son of former President Amine Gemayel. 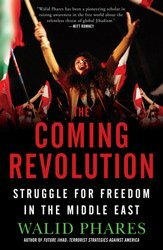 In May 2008, Hezbollah mounted a full-fledged military invasion of West Beirut and parts of the Druze Mountains, which crumbled Fuad Siniora's pro-Western government and propelled Hezbollah to the fore of Lebanon's national security policy. Since then, no domestic force has been able to confront Hezbollah or pressure it into disarming. Hezbollah has reason to fear the Special Tribunal, whose mandate covers more than the Hariri murder. It includes prosecuting the assassinations of Cedar Revolution leaders Samir Cassir, George Hawi, and Lebanese parliamentarian Jebran Tueni, as well as the bloody attempts against former Telecommunications Minister Marwan Hamade and journalist May Chidiac. If the U.N. pins Hezbollah down on Hariri, the verdicts won't stop there. It would criminalize Hezbollah's so-called "political" and "military" wings alike, resulting in further investigations for the murders of Lebanese politicians and political dissenters. The organization would be criminalized under international law, and countries like the United Kingdom and France, which have begun to engage it politically, would be forced to desist. Hezbollah could even face international warrants for the arrest of its leaders. The consequences would be cataclysmic for the group, destroying the image it cultivates as a legitimate resistance movement. The Iranian regime cannot afford to lose so precious an ally in Lebanon, and Syria's Baathist regime knows all too well that if Hezbollah goes under, it will drag many in Damascus down with it. So the Iranian-Syrian-Hezbollah axis has locked the tribunal in its crosshairs. The U.N. originally established the tribunal as an international criminal court, comprised of judges from Lebanon and across the world, to prosecute the acts relating to Hariri's assassination under Lebanese law. Under Chapter 7 of its charter, the U.N. is required to provide force to execute its decisions, if necessary, but it cannot do so without the support of the Lebanese government. At the time, that would have been possible, as many Lebanese politicians publicly accused Syria's Assad regime of the assassination, and observers predicted that the tribunal could even result in the indictment of Syrian officials. The Lebanese government was then headed by a pro-Western, anti-Syrian majority, and was modestly willing to push back against Hezbollah. When Hezbollah invaded Beirut and toppled then-prime minister Fuad Siniora's cabinet in May 2008, it brought in a new government headed nominally by Saad Hariri, but with a pro-Syrian President, General Michel Suleiman. It had also by then penetrated Lebanon's security apparatus, giving Iran an implicit veto. That's why when the tribunal issues its verdict, the Lebanese government is unlikely to make any arrests. In preparation for the forthcoming showdown, Hezbollah has been hyperactive in identifying and arresting anyone it believes would support the indictments, branding them as Israeli spies, and agents of a "vast Zionist conspiracy." Thanks largely to bountiful Iranian aid, Hezbollah is winning its war against international justice. The Turkish government even suggested that the Special Tribunal postpone its decisions. And Lebanese officials, including traditionally anti-Syrian politicians, have been bullied into saying that they would consider any indictment of Hezbollah an act of aggression against the Lebanese Republic. The message to those in the U.S. and Europe looking for "dialogue partners" should be clear: There are no moderates in Hezbollah. When the Special Tribunal issues its final verdict, let's hope for Lebanon and the region's sake that the U.N. and the West will have the courage to enforce the prosecutors' findings. Mr. Phares is the director of the Future Terrorism Project at the Foundation for Defense of Democracies, a Fox News contributor, and author of "The Confrontation: Winning the War against Future Jihad" (Palgrave MacMillan, 2008).